CECAFA Secretary General Nicholas Musonye and hosts Federation chairman Sam Nyamweya on Thursday morning led the Local Organizing Committee members in launching the 2013 edition of the CECAFA Senior challenge Cup that will be held in Kenya starting 27th of November. 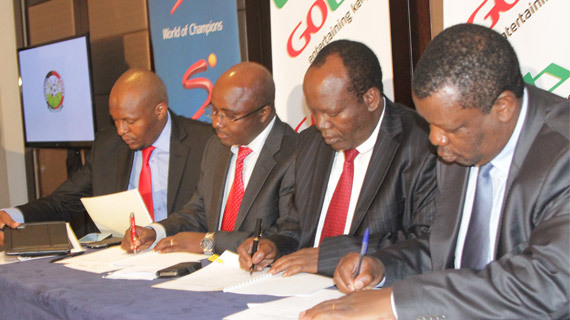 During the launch, pay TV Company GOtv announced USD 125,000 (10 Million Kenya shillings) Sponsorship commitment towards the tournament that places them as the title sponsors of the region’s biggest soccer extravaganza. CECAFA Secretary Nicholas Musonye has however urged more sponsors to come on board and chip in towards ensuring the tournament is a big success because the Local Organizing Committee requires more money. “I appreciate the support from GOtv and SuperSport, they have always been there for us and as CECAFA we want to assure you we will do everything possible to ensure the tournament is successful. I also want to call on those who were not sure that the tournament will take place to jump on the bus before it is too late.” Musonye said. “The biggest sponsors of Kenyan soccer are the spectators and we urge our Kenyans fans to come out in large numbers throughout the tournament. We have spread it to many cities so that we give all Kenyans an opportunity to watch other nations play at their backyards.” Said FKF Chairman Sam Nyamweya.